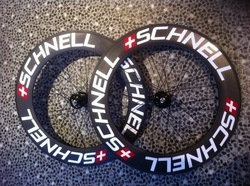 SCHNELL "BLADES" (TRACK WEAPONS) "WARNING THESE ARE FAST"
At SCHNELL we not only test , develop and race wheels that are for road racing but we also take Track racing seriously. 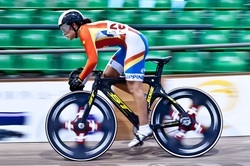 We studied the aero dynamics and fluid dynamics of a lot of wheels and noted some characteristics in certain wheels that were present which caused the wheel to remain stable under high speeds and heavy loads without losing AERO properties. 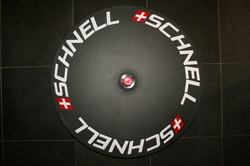 For races where you require a fixed gear wheel for sprinting you can't go past SCHNELL BLADES. THE TCR9 IS A VERY AERODYNAMIC 90mm DEEP WHEEL. ITS FORMED USING TORAY T700 CARBON FIBRE UNDER HIGH PRESSURE TO EXTRUDE ANY AIR FROM THE CARBON WALL. WE BUILD THESE WITH AERO BLADED SPOKES AND A FAST ROLLING TRIED AND TESTED TRACK HUB. THE RESULTS SPEAK FOR THEMSELVES. AVAILABLE IN UD MATTE (POPULAR) OR 3K CARBON FINISH. THE TCR5 IS A VERY AERODYNAMIC 50mm DEEP WHEEL. ITS FORMED USING TORAY T700 CARBON FIBRE UNDER HIGH PRESSURE TO EXTRUDE ANY AIR FROM THE CARBON WALL. 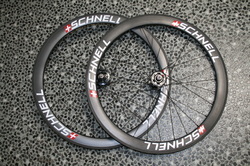 WE BUILD THESE WITH AERO BLADED SPOKES AND A FAST ROLLING TRIED AND TESTED TRACK HUB. THE RESULTS SPEAK FOR THEMSELVES. THIS WHEEL IS AMAZING ! WE USE V.C.T IN OUR LATEST TT WEAPON. IT CAN BE USED FOR ROAD AND TRACK. YES A DUAL PURPOSE WHEEL. CHECK IT OUT!